Historically within Hinduism there are two conflicting philosophies regarding the relationship between living beings (Jiva or Atma) and God (Ishvara, Brahman or Bhagavan). Advaita schools assert the monistic view that the individual soul and God are one and the same, whereas Dvaita schools give the dualistic argument that the individual soul and God are eternally separate. The philosophy of Achintya-bheda-abheda includes elements of both viewpoints. The living soul is intrinsically linked with the Supreme Lord, and yet at the same time is not the same as God - the exact nature of this relationship being inconceivable to the human mind. The spirit Soul is considered to be part and parcel of the Supreme Lord. Same in quality but not in quantity. The Supreme Lord Sri Hari having all opulence in fullness, the spirit soul however having only a partial expression of His divine opulence. The Lord in this context is compared to a fire and the spirit souls as sparks coming off of the flame. The theological tenet of achintya-bheda-abheda tattva reconciles the mystery that God is simultaneously "one with and different from His creation". In this sense Vaishnava theology is panentheistic as in no way does it deny the separate existence of God (Vishnu) in His own personal form. However, at the same time, creation (or what is termed in Vaishnava theology as the 'cosmic manifestation') is never separated from God. He always exercises supreme control over his creation. Sometimes directly, but most of the time indirectly through his different potencies or energies (Prakrti). Examples are given of a spider and its web; earth and plants that come forth and hair on the body of human being. "One who knows God knows that the impersonal conception and personal conception are simultaneously present in everything and that there is no contradiction. Therefore Lord Caitanya established His sublime doctrine: acintya bheda-and-abheda-tattva -- simultaneous oneness and difference." (A. C. Bhaktivedanta Swami Prabhupada) The analogy often used as an explanation in this context in the relationship between the Sun and the Sunshine. For example, both the sun and sunshine are part of the same reality, but there is a great difference between having a beam of sunshine in your room, and being in close proximity to the sun itself. Qualitatively the Sun and the Sunshine are not different, but as quantities they are very different. This analogy is applied to the living beings and God - the Jiva being of a similar quality to the Supreme being, but not sharing the qualities to an infinite extent, as would the Personality of Godhead himself. Thus there is a difference between the souls and the Supreme Lord. It is clearly distinguished from the concept of anirvacaniya (inexpressible) of Advaita Vedanta. There is a clear difference between the two concepts as the two ideas arise for different reasons. Advaita concept is related to the ontological status of the world, whereas both Svayam bhagavan and his shaktis (in Lord himself and his powers) are empirically real, and they are different from each other, but at the same time they are the same. But that does not negate the reality of both. While it applied to relations between Purusha (the Lord) and Prakriti (be it material, marginal, or spiritual powers), in the theology of the concept there are areas of exceptions. Jiva Goswami also accepts that any object and its energy are non-different, such as fire and power of burning. While some maintain that its only a secondary extension of the principle that it is primarily applied to Svayam bhagavan and His energies. It does not, however, apply to differences between Avatars of Svayam bhagavan and Lord Himself, so the difference between Vishnu and His origin, is not covered by the concept of acintya bhedabheda, i.e. it cannot be applied in cases where different levels of Purusha are compared. The phrase is used as the chorus line in Kula Shaker's 1998 hit song Tattva. "Achintya-bheda-abheda-tattva". ^ Kaviraja, K.G. Sri Caitanya-caritamrita. Bengali text, translation, and commentary by AC Bhaktivedanta Swami Prabhupada. Bhaktivedanta Book Trust. Madhya 20.108-109 Archived 11 May 2008 at the Wayback Machine "It is the living entity's constitutional position to be an eternal servant of Krishna because he is the marginal energy of Krishna and a manifestation simultaneously one with and different from the Lord, like a molecular particle of sunshine or fire." ^ "Additional information". Krishna.com. Archived from the original on 7 June 2002. Retrieved 16 April 2008. "Lord Chaitanya taught that as spirit souls we are part of God and thus we are not different with Him in quality, and yet at the same time we are also different from Him in quantity. This is called acintya-bheda-abheda-tattva, inconceivable, simultaneous oneness and difference." ^ Satsvarupa, dasa Goswami (1976). "Readings in Vedit Literature: The Tradition Speaks for Itself": 240 pages. ISBN 0-912776-88-9. ^ "Additional information". Tatfoundation. Archived from the original on 12 May 2008. Retrieved 16 April 2008. "This interpretation of the Upanishads, that the individual soul and God are absolutely non-different, is what distinguishes advaita from other forms of Vedanta." ^ "Additional information". dvaita.org. Archived from the original on 12 April 2008. Retrieved 16 April 2008. "Dvaita,... asserts that the difference between the individual soul or Jiva, and the Creator, or Ishvara, is eternal and real"
^ Prabhupada, A.C.Bhaktivedanta Swami (1988). 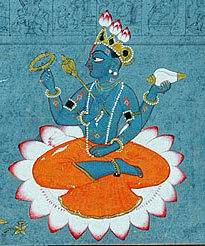 Srimad Bhagavatam. Bhaktivedanta Book Trust. Bhag. 4.31.16 Archived 26 September 2007 at the Wayback Machine "One may be in the sunshine, but he is not on the sun itself." ^ Kaviraja, K.G. Sri Caitanya-caritamrita. Bengali text, translation, and commentary by AC Bhaktivedanta Swami Prabhupada. Bhaktivedanta Book Trust. Madhya 6.163 "Qualitatively the living entity and the Supreme Lord are one, but in quantity they are different"
^ S. Devadas Pillai, ed. (1997). Indian Sociology Through Ghurye: A Dictionary. Columbia, Mo: South Asia Books. p. 403. ISBN 81-7154-807-5. This page was last edited on 1 October 2018, at 12:10 (UTC).